This is a simple story. It begins with an immigrant grocer selling vegetables from a pushcart and ends in a court case with two billion dollars at risk. Two brothers, sons of the founder, inherit equal shares of a burgeoning food chain. One dies, and his widow, suspecting that she is being short-changed from profits earned, sues to recover. Now it becomes complicated. The author, an insider with over thirty years working in the food industry, spins a yarn of a twisting, turning labyrinth that features a love tryst, intrigue, betrayal, and greed. The characters and dialogue are real, authentic, and they draw you from the printed page into the middle of this fast-moving action. Russell Riley is the highest-ranking non-family member of this company and it's his job to protect and grow the business while the two families duke it out in court. But even he can't stay entirely above the fray because he owns stock that could provide the swing vote for control. 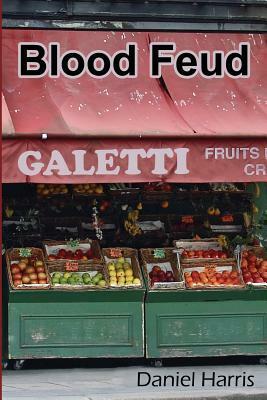 If you are in the mood for an insider's take on a nasty and vitriolic family food fight that ended in a celebrated court case, Blood Feud is it. Here is a story that is one of sadness because at the end the family is no longer speaking to one another. A family like so many that were close and they all worked together to build the family business. Started by their father. It is told by a third person who practically grew up in the store himself after his father passed away and the owner gave him a job at the age of 13. From there he worked his way up doing the different jobs in the store. He was also in the same class as the youngest son so they all knew each other and over time he would be invited to Sunday dinner at their house. When the two sons graduated from college and started running more of the business they wanted to expand. Which they did slowly making sure each store was paid off and running smoothly until opening the next one. After a few stores they offered Russell Riley, who is telling the story an opportunity to go to college that the company would pay for but he would need to still work for them for so many years. He agreed. A few years later after more stores were open and the company was really growing they decided to offer him part owner ship in the company about 12 shares the rest being split up between the two brothers families. By this time the father and mother had passed on. They were at somewhere like 13 stores when the oldest died unexpectedly of a heart attack. His wife who was already working for the company took over his position and things were going smoothing. After a few years there was more building of stores and then the two oldest sons from each family after finishing school started working for the company. It look like everything was the way it was supposed to be. Then the wife of (widow) of the oldest son got a tax bill for 5 million dollars, saying stock had been sold and she owed the IRS. Going to her brother in law he told some story and then got mad so she left and hired a lawyer. He tried to fire her from the company but could not. Then the court battle started and they tried to bring him into the middle but for the most part he stayed out of it as much as he could. When they went to court the brother in law said he sold the stock at the time of his brother’s death because his family needed money and he was the executor of the will. He also tried to explain that he felt that they only owned the shares up to his death. Not since they added another 20 or more stores. She countered by saying that she was still working for the company and that by never remarrying her family (his children ) were entitled to equal shares as per the agreement that was signed that night so many years ago. The jury agreed with her plus found him guilty of misappropriation of funds. Mr. Riley decided to sell his shares back to the family equally and walked away from a place that was more than a job but a life. And he unfortunately saw a family that once got together for Sunday dinner now not talk to one another. A sad story. I got this book from net galley.